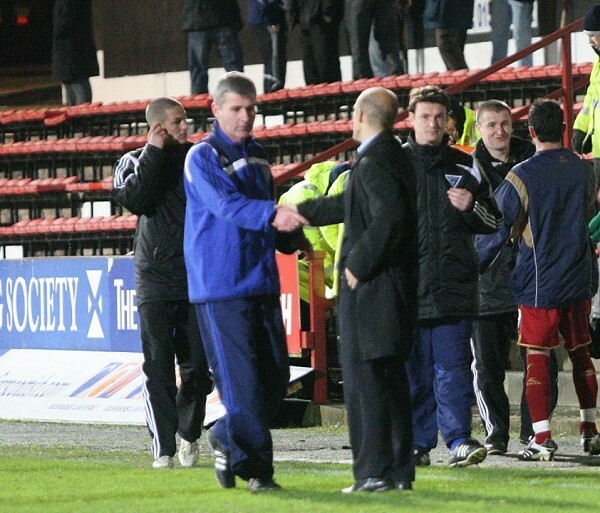 For the visit of second placed Dundee Stephen Kenny was without skipper Scott Wilson - out with a knee injury. Bobby Ryan and Michael McGlinchey were missing from the team that started the Challenge Cup Final meaning there was a first start for 28 year old Welshman Jamie Harris with Darren Young and Jim Hamilton making up the eleven. The formation was again 3-5-2 with Sol Bamba in the centre of the back three. Dundee were unchanged from the side that defeated Hamilton the previous Saturday and it was Derek Lyle who kicked off for them, attacking the goal in front of the McCathie Stand. Bob Davidson created an early fright for the Pars rounding Bamba after just 80 seconds. From deep on the right he sent over an inviting chance that Lyle narrowly failed to connect with, just six yards out. The visitors won the first corner of the match in eighth minute but Harris headed that away and Gallacher held the lofted shot as the ball was returned. For the Pars Mark Burchill's run down the left and cross through the Dundee penalty box gave the up until then, very quiet home support something to cheer. In 13th minute Burchill won a corner on the right that captain Stephen Glass sent inswinging into the six yard box but everyone missed the chance. A forward run by Stephen Simmons four minutes later latching on to a Calum Woods pass and taking the break off Kevin McDonald almost presented Young with a shooting opportunity but the final touch allowed the Dundee defence to clear. Young tumbled Robertson to give Dundee a 20th minute free kick in a useful position on the right side but Simmons easily headed away Paul McHale's delivery. The Pars were beginning to enjoy more possession but their play was punctuated with misplaced passes and overstruck balls. Dundee were certainly not making life easy closing down their opponents extremely quickly. Following another Dundee corner In 29th minute Davidson returned the ball to the far post but Derek Lyle couldn't meet it and still neither keeper had anything of significance to save. Next minute Craig Samson, the Dundee keeper, maybe should have saved Burchill's shot as he came rushing out, but Eddie Malone cleared off the line and McDonald sent the ball behind for a corner. 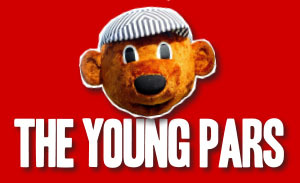 Young's corner and subsequent return were both dealt with by the Dundee defence. The Dens Park side flashed another cross in front of the Pars goal when McHale and Davidson sent Lyle deep to the corner flag amidst loud appeals from the North Stand for offside. Hamilton pushed a penetrating ball towards the Dundee box but Simmons chase to be on the end of it was squeezed out by the red shirted defence. The visiting fans were doing there bit to warm the atmosphere so much so some of them removed their shirts and they teased the Rock Steady stewards as they attempted to enforce the all seated requirement. Back on the pitch the match reached half time with only one Pars attempt at goal and Pars keeper Paul Gallacher yet to be tested. Michael McGlinchey was a half time substitute for Stevie Crawford and Calum Woods put in the Pars second shot at goal - albeit off target - after just two minutes. Bamba headed a Malone cross behind for a corner on the left and although Swankie's first came to nothing, a Harris miskick handed them another and this time McKenzie was unlucky to turn the ball beyond the far post. Milan Palenik then headed a Malone free kick over the crossbar as the visitors enjoyed the territorial advantage. 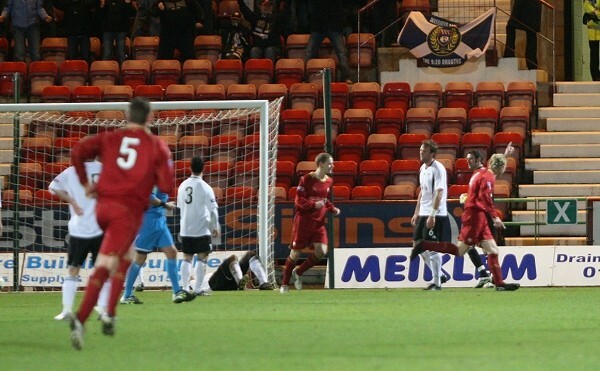 Murphy blocked a Lyle shot, then Bamba from McDonald and Bamba from Swankie as Dundee turned up some serious pressure. Simmons provided the Pars first shot on target of the half in 59 minutes after neat play from McGlinchey and Burchill, but the effort went straight into the grey shirted body of Craig Samson. Jani Sturm came on for Davidson and caused Bamba some concerns, persevering to cut the ball back into the Pars penalty area. The home side got some respite when McGlinchey's cross to the far post was headed behind by Malone. Although the corner was cleared it fell for Darren Young to get a decent strike at goal but it hit the feet of Lyle. A McHale lob into the Pars box was coolly sent out for a throw in and it was Bamba yet again who cleared the danger from that when Sturm laced the ball into the six yard box. Alex Rae replaced Derek Lyle with twenty minutes remaining and sub Jan Zemlik got an early chance that Gallacher held. Dunfermline's chances were just half chances with Hamilton heading wide on two occasions. In 73rd minute Dundee turned their pressure into a lead. 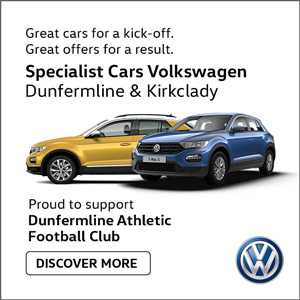 A lofted pass into the left side of the Pars box from Paul McHale drew Gallacher to the edge of his six yard box and Dundee's Slovenian, Sturm cut the ball back for McDONALD to smack into the net from five yards out. Stephen Simmons had a good strike at goal from 25 yards but McDonald blocked that before Rae's team took the game back in front of their vocal fans. Robertson should have done better with a chance that he delivered too far right for Sturm. Darren Young was injured in a tackle on the left that gave Dundee a free kick and he was helped off. Bamba headed away McHale's cross before Iain Williamson eventually came on as Dunfermline's second sub of the game. Williamson tried to inject some urgency shooting with his first touch and hitting the stanchion behind the goal from 30 yards. Time was running out when Calum Woods deflected a Zemlik shot on to the roof of his own net but merely allowed them to run the clock down. At the end it was another defeat for the Pars and yet again they left the field to boos from the McCathie Stand. Thanks to Hamilton's 4-2 win at Stirling Dunfermline remain in 9th place but 21 points behind the leaders.